This epic 5 reel, 30 payline game whisks the player off on an epic exploration of a fantasy jungle where sabre toothed tigers and dinosaurs roam. On this quest, 3 or more world globe Scatters appearing across the reels trigger a generous 15 FreeSpins in which Multipliers of up to 10x can be achieved. 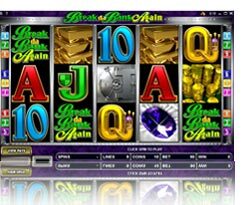 Bet from as little as 0.30 to as much as 12.00 with a chance at rewards of up to 12,000 in the base game - a windfall that can grow to ten times that on FreeSpins! Based on the popular 5-reel Break da Bank Again!, this vibrant 9-line enhancement takes the tried and tested original concept and multiplies the action by 4! 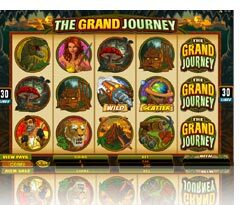 The game actually consists of four individual slots, each of nine lines, enabling the player to win FreeSpins on multiple slots simultaneously and reap some serious rewards ... up to almost 100,000 on maximum bets! Let's start the year off with a bang with this old favourite, famous for having a jackpot which never falls below $1 million! It seems like yesterday that we were handing over a cheque for $5.5 million to K.E. when he cleared out the jackpot a couple of years ago; then of course we were doing the same thing with A.D. last October for ?3.8 million! Will you be the one to do the same in 2012? You'll have to play to find out! 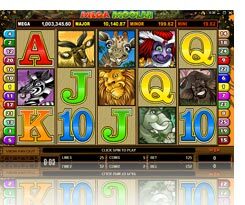 Play Mega Moolah this month and you will be credited with DoublePoints.